Our lives are filled with responsibilities and opportunities. We all go through the process, unknowingly or unconsciously at times, the process of prioritizing. What comes first in our day, our year, our life? Sometimes family has to come first, sometimes work or school, sometimes rest and relaxation. 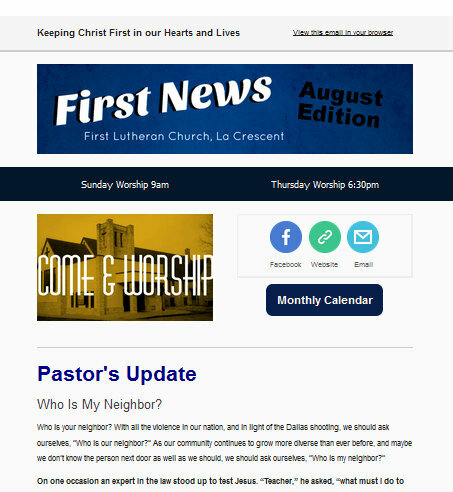 Above all, as the first priority, the members of First Evangelical Lutheran Church focus on Keeping Christ First. We place Christ first in worship, in study, at home, work or play because although we did not deserve it, God put us (the world) first by sending Jesus Christ as Savior. We invite you to join us in Keeping Christ First in our Hearts and Lives through the grace of God found in the Bible. Get our once a month newsletter, subscribe below!